Southern Garden by Oneida Crystal Iced Tea Goblets. Mint condition. No damage, scratches, chips or cloudiness. PRICE IS PER TWO. $22 for TWO. I have FIVE sets (so 10 total). Shipping cost is per two. Rarely used and in excellent condition. Made in Italy. Oneida Crystal Goblets--"LUCIA"--Set of (4)--(2) Sets Available--BUY IT NOW! Great Shower present for a wedding Couple or anniversary gift or for Yourself! Made in Italy. The spots on the glass are tiny dust spots that show when photographed. I do have more pictures if you would like to see more. Army S'Mores Ornament. New Never used. Measures 3 inches tall x 1-3/4 Buyer pays for shipping. Paypal is any accepted as method of payment. Any questions, please contact me. Thank you. 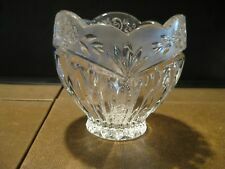 Up for sale is a beautiful Oneida Southern Garden crystal potpourri bowl made in Germany. It has a carved rose design with a frosted rim at the top. It shows no signs of use and still has the original label attached.a very nice looking piece. Southern Garden by Oneida Crystal Potpourri Bowl Frosted Floral Scallop Edge. Mint condition. No damage, scratches, chips or cloudiness. Oneida Crystal. SOUTHERN GARDEN. Three 7" Bud Vases. Two 3 3/4 Potpourri/Petal Bowls. Beautiful Oneida Crystal Votive Candle Holder,Southern Garden pattern (discontinued). Rose design in clear and frosted glass.VERY heavy crystal 1 lb. It has never been used and is in its original box. It stands at 1 7/8" tall. Pattern: LAURUS. GORGEOUS pitcher with four matching tumblers. Manufacturer: Oneida Royal Crystal Rock. Never used! Box is original and intact, but top side is dented. (see pictures). These are in beautiful condition. Perfect for a wedding gift. They are 3 different sizes. Only one identification mark remains. Lovely- completes my set. Top Drawer all the way! Prompt & Courteous Service! For sale is one new West Germany Tosca Gold water goblet. This is a Oneida Crystal 5" Celeste Hostess Bowl. Beautiful sweetheart bud vase by Oneida made from 24% lead crystal in the Southern Garden pattern. This bud vase is 7" tall and 1.25" wide. The stem is fluted and the top edge is gently scalloped. The frosted top has a lovely etched/cut rose and leaf pattern and alternating fan spray. Sachet & 4" Petal Bowl. NEW in Box Oneida Crystal. Southern Garden. We are not responsible for the item after it leaves our hands. Vintage Oneida Lead Crystal Cut Glass Votive Holder, Candy Dish 3"
Votive Holder, Candy Dish. Lead Crystal Cut Glass. They are from an estate sale and are a bit dirty -they will need to be washed. I have 2 sets of the iced tea glasses and another set of water goblets listed. I'll be happy to answer them! Set of 3 Oneida Tosca Platinum Iced Tea Glass 7 1/4"
They are from an estate sale and are a bit dirty -they will need to be washed. I have another set of the iced tea glasses and 2 sets of water goblets listed. I'll be happy to answer them! Pattern: TOSCA PLATINUM. Manufacturer: Oneida. Piece: Wine Glass. China - Dinnerware Crystal & Glassware Silver & Flatware Collectibles. Canadian and international orders. U.S. Expedited. Oneida Crystal~Spring Lace 5" Basket (Without Handle) I Would Say This Is "RARE"
Well when deciding to downsize my collections of gifts I opened the box and much to my surprise this Basket had no handle. There is a place for it, but it's not there. So this still is usable probably for anything you would like to put in a little bowl. It was made in Germany. The crystal is clear and clean. There is what appears to be a tiny flea bite to the left of the handle, but it is not noticeable (see the last picture above). This piece is very heavy. New (no box) Oneida crystal vase in contemporary design. Black (or very dark blue - I can't tell). Measures 3 inch diameter, and approx 5.5 inch tall. The vase is the same diameter at the top as the bottom. The angle of some of the pictures makes it look like it flares out, but it is like a tube with parallel sides. It is hand blown over 24% lead crystal and weighs just over 1.5 lb (hence the price to ship). Unused, however for the pictures, I just put a stem in with no water. Unwanted gift. The white marks on the rim are light reflections. They are from an estate sale and are a bit dirty -they will need to be washed. I have another set of the iced tea glasses and 2 sets of the water goblets listed. I'll be happy to answer them! Southern Garden Sachet Made in USA Sachet 1 3/4 oz. Crystal Bowl can be used to hold Potpourri, candy or trinkets. New in Box. Oneida Lead Crystal Southern Garden Potpourri Bowl. Frosted and Cut Floral Border. Scalloped Edge. Very Good Previously Owned Condition with Little to No Signs of Use. Made In Germany. Pattern: Southern Garden by Oneida. Item#: 73609 Pattern Code: ONCSOG. Width : 9 1/2 in. These are beautiful, well cared for candle holders that were never used, only displayed in a china hutch. In perfect condition. Oneida Crystal Southern Garden Rose Candy Dish / Votive Holder / Bowl. Awesome shape. No chips, cracks or grazing. Made in Germany. Please check out the photos. Ask any questions. It comes from a smoke free environment. Shipped with USPS Priority Mail. Oneida Crystal Covered Candy Dish. Crystal Clear with Frosted Rim. Southern Garden ~ Petal Bowl Rose Design. New ONEIDA cut glass vase. Made in Germany. Oneida Southern Garden Salt & Pepper Shakers. The stoppers are turning a pinkish color. See pictures as reference. Item Number: C027 077S. Southern Garden 1-3/4 OZ Sachet & 4" Petal Bowl. Sachet Made in USA. 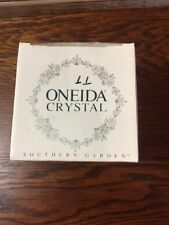 Oneida Crystal in original box. Oneida LTD. 1992. Petal Bowl Made in Germany. Oneida, Y 13421-2829. Made in Germany. vintage Oneida 2 ½” x 4 ½” LEAD CRYSTAL CANDY / CHIPS BOWL ~ very nice server! Holy salsa dip, Batman! This Bad Boy features a fine shine and a great look! All pieces are sold“as-is, as-shown. ”. e B a y S e l l e r s i n c e 19 9 8 . TAKE A LOOKSEE! (Sorry, I can’t make it as I’ll be at the Waldorf for my daily aperitif.). • For your consideration from an estate sale is a beautiful set of 2 crystal iced tea glasses. • Pattern: Southern Garden by Oneida. They are heavy enough that you don't feel uncomfortable holding a delicate crystal piece.